Some of you may have seen the Man vs Food Atlanta episode when he visited the pizza shop in Kennesaw. 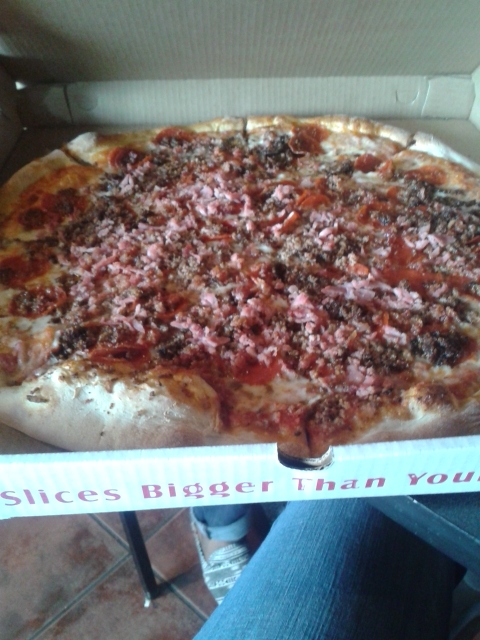 The shop is known for it’s gargantuan XL, 30 inch pizza. Just for a visual the pizza box is about the size of your average stove top. 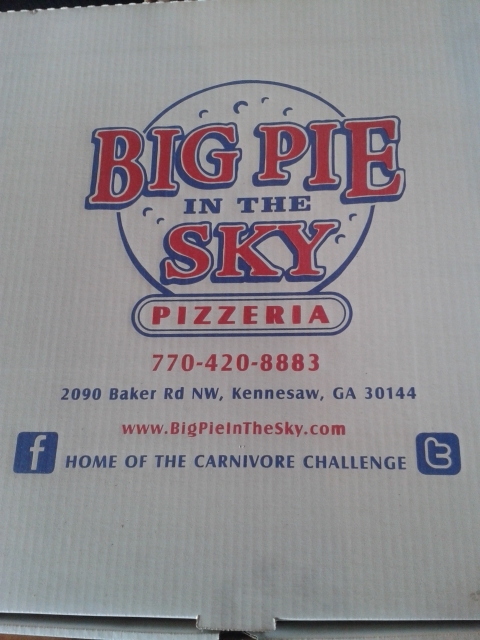 Big Pie is probably best known for their Carnivore challenge. 2 people, 1 hour, 11 lbs of pizza. I’ve had a slice of carnivore and I must say, it’s not their best but then again, I’m not a huge meat person. But I do know good pizza. The cheese is good quality, the sauce is tasty but not sweet like a lot of chains and the crust is extremely tasty. This past weekend, I had the pleasure of trying the West Coast Pesto. This was sooooooooooooooo tasty, I have every intention of attempting to replicate it at home in the near future. 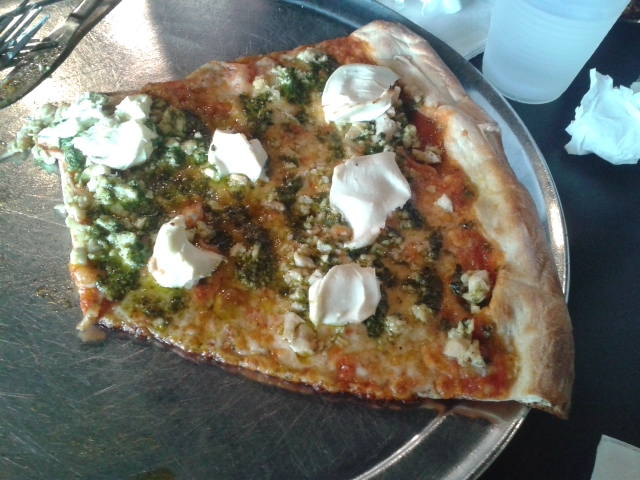 It has pesto, grilled chicken, and cream cheese and is delicioso. I don’t know what’s best about this place, the good food, the price, or the amount of food. The specialty pizzas range from $5-$6 and they’re the size of an infant!!!!!!!!!! Seriously, you only need one slice. If you’re a pizza lover, highly recommend that you make that trip to Kennesaw for a slice. This place definitely gets a Special K rating!!!!!! 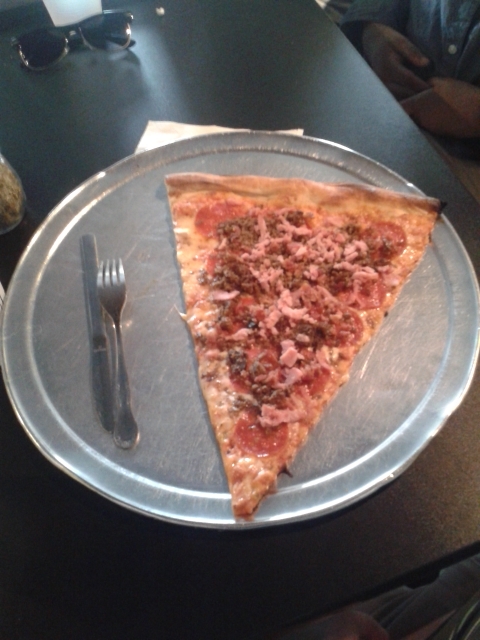 Notice how large the slice is compared to the fork. This is the large Carnivore. It’s 20 inches and fed 6 adults.